I'm going through a personal dance funk, which happens to every dancer periodically. In order to bolster my spirits, I've been trying to connect with the reason why I dance. No "big revelations" yet, but here's some inspiring videos of hip-hop dancers who have clearly had to overcome difficulties way beyond what I've ever had to face. These are all dancers who have various physical "limitations" that didn't keep them from rocking the cypher. Check em all out! First up, B-boy Junior. About every month or so someone sends me a video of him saying, "This is the best b-boy in the world." This French breaker is somewhat of a mystery. B-boy forums spread rumors that he has a false leg due to polio, or just one leg that isn't as strong as the other. Whatever it is, clearly it has not stopped him from doing some heart-stopping freezes and powermoves. 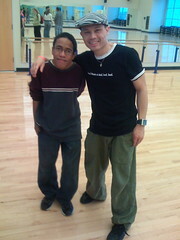 Chibi Robot (Brian Gaynor) is another great example of a hip-hop dancer who hasn't let his physical limitations stop him. Chibi has scoliosis, which inhibits his range of motion and flexibility. But he works what he's got and he's adapted a danceform, popping, that allows him to be expressive and creative. where he was teaching a workshop at the Swing and Soul festival. He's a humble young man who just wants to do what he loves and share it with others. I'm not sure how I feel about the title of this "champutee battle," but both b-boys are showing a lot of passion and power in their dancing.